Some of Southern California’s “lost towns” never actually vanished; they simply assumed new identities. That’s what happened to one small San Fernando Valley farming village that sprang up in the late 1880s — a village we know today as North Hollywood. The town’s name was born unstable; in its early years, residents feuded over what to call their home. Some preferred Lankershim — a name that honored James B. Lankershim and his father Isaac. In 1888, Lankershim subdivided the easternmost 12,000 acres of his father’s old wheat ranch, carving the vast tract into farms of 10 to 80 acres each. 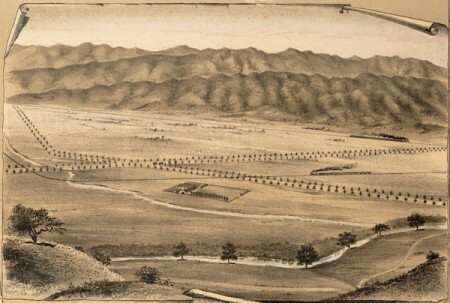 On the map advertising the new venture, the Lankershim Ranch Land and Water Company identified a prospective townsite where the old road to the San Fernando Mission crossed a newly graded road, Central Avenue. The map identified the townsite as Lankershim.